Alright, what is this naughty girl doing here when she is supposed to be studying? Well, she just misses her blogging life and intended to at least post something. I have just tackled the first paper this morning, and hopefully I’ve done well, I wrote till my hand got sore. That should be good news right? 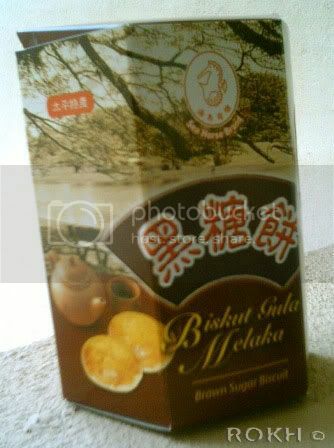 Anyway, mum had just bought a yummy biscuit made in my home town, Taiping, which she had dad brought up to KL for me. My dad works here and he travels back fortnightly. I’ve tried biscuit before, and had an almost addictive liking to it, which I “naturally” mentioned to mum, and so, she bought 2 boxes for me this time! Thank you mum! It is just what I needed, a non-homemade-as-I-do-not-have-the-time comfort food to fight the exam blues. 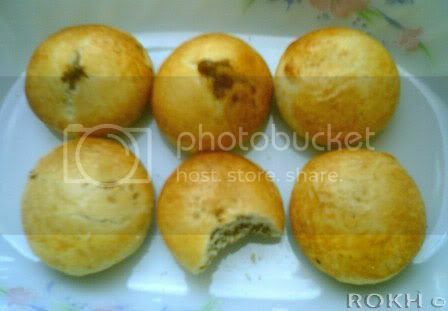 It’s a sort of biscuit, with thick floury and buttery skin, wrapped around gula melaka, which is already all chewy and sweet. It has good combination of texture and taste which just have your hands keep crawling back into the box for more! By the way, the box is really cool, it has the picture of the Taiping lake garden at the top. Now, I have to stop ranting or I’ll start to sound like a girl gone mad from studying, back to where I belong now, the books!